Tonkatsu is a Japanese fried cutlet, usually made from pork, dredged in panko and deep fried, it gets served with a sauce that is widely called "bulldog sauce" after the popular brand of tonkatsu sauce. Bulldog sauce or tonkatsu sauce is drizzled over the cutlets and the shredded cabbage that typically accompanies katsu. Think of American fried chicken and coleslaw as a rough analog. It's the winter-without-end here in Boston this year and one of the best things about winter is cabbage. I'm sure you hear that all the time. Seriously though, this time of year you can get some of the tastiest, sweetest, crunchiest cabbages. I can't get enough. Purple, napa, green, savoy...bring on the brassicas! Cabbages are loaded with Vitamin C, they're probiotic (which means they help your gut generate the good bacteria that supports immune health) and they're satisfyingly crispy crunchy with a bittersweet flavor that is a perfect foil to many of our winter braises. Coming off the Seafood Expo I brought home a salmon skin from a whole side of salmon we were sampling. Today's lunch was rice, miso soup, roasted crispy salmon skin with grated daikon, shredded cabbage and homemade tonkatsu sauce. I developed this recipe for you to enjoy at home. Using ingredients that you'll either have on hand or be able to get at any grocery store, this sweet and savory Japanese condiment is now within reach. This sweet and savory sauce is perfect for fried cutlets or something roasted or broiled. It would also be fantastic on a hamburger. 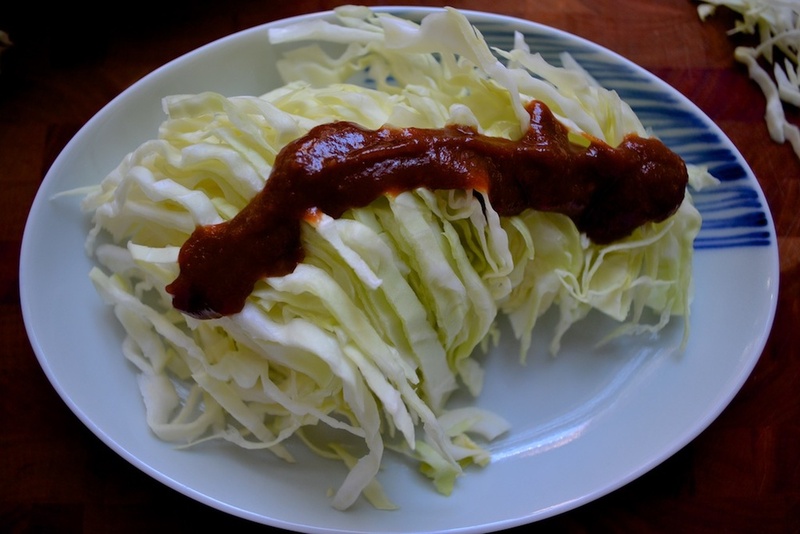 Drizzle over cabbage and tomato slices for a Japanese "sarado" (salad). If A1 sauce and ketchup had a beautiful baby, it would be this sauce. With a tomato base, some fruit, some fish sauce, it's packed with umami. It's sometimes described as Japanese barbecue sauce but I've never seen it used that way here. Now that I think of it, though, could be great. With any simple dish, the quality of the ingredients is paramount. Here I include the brands I like for reference. This has so much umami, I'm sure it would be great with regular supermarket brands, too. In a medium bowl, combine all ingredients and whisk to blend thoroughly. Store in jar for a month or so, if it lasts that long. Drizzle over cabbage, fried cutlets, serve on burgers. Maybe bake some chicken legs with this as a basting sauce.